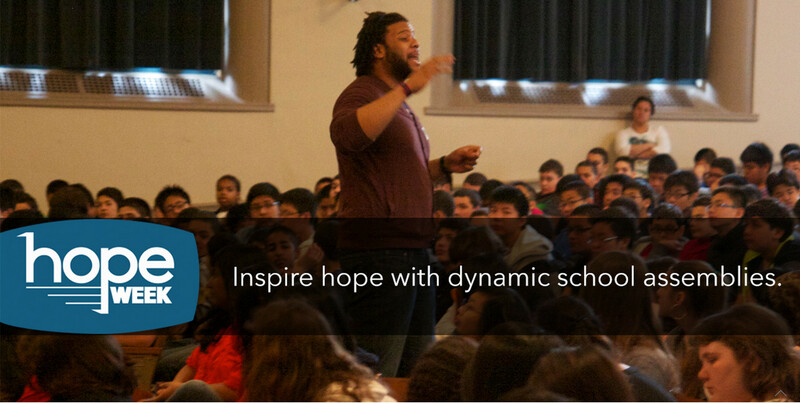 Thrive Collective creates hope and opportunity through arts, sports, and mentoring in and around public schools. 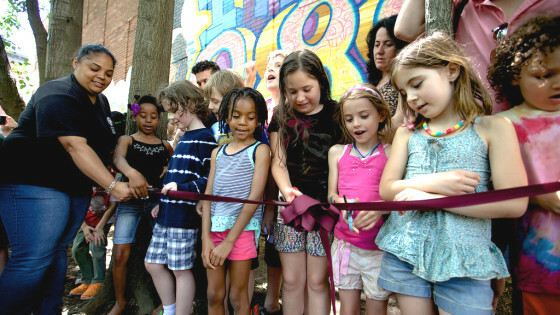 Our core programs – Murals, Music, Media, Mentors, and Sports – connect artists, youth workers, and volunteers with local schools as teaching artists, art directors, coaches, and mentors. Project based learning and accredited curriculum integrate life and art skills in four kinds of experiences: in-school electives, after school clubs, seasonal intensives, and weekend warriors. 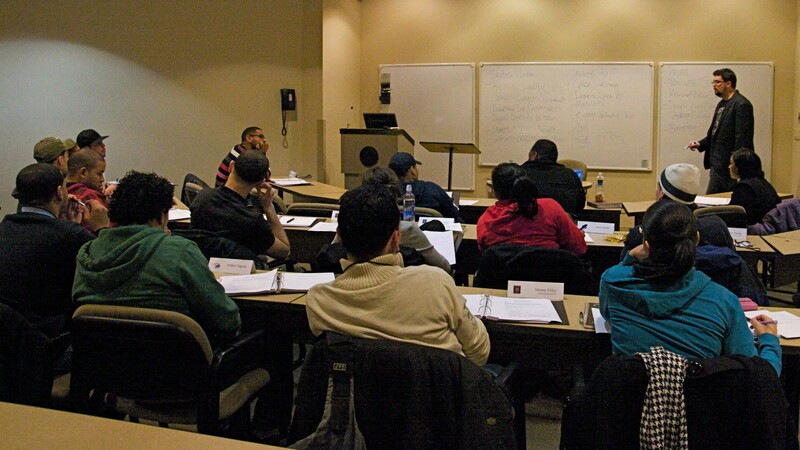 We incorporated in 2011 as a 501(c)(3) organization, and are a licensed New York City vendor with numerous agencies. 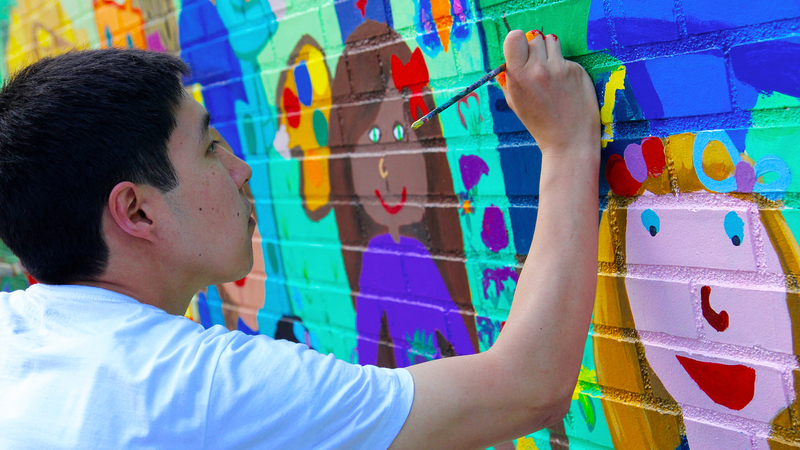 In 2018, Thrive’s core programs worked with 3,000 students in 28 schools, producing 32 school murals totaling over 10,000 sq. ft. of public art; nearly 40 art festivals, ribbon cutting celebrations, and school assemblies; a dozen student films; a dozen sports clinics and basketball tournaments; and 100% of graduating seniors from its School Mentors programs were accepted into college. 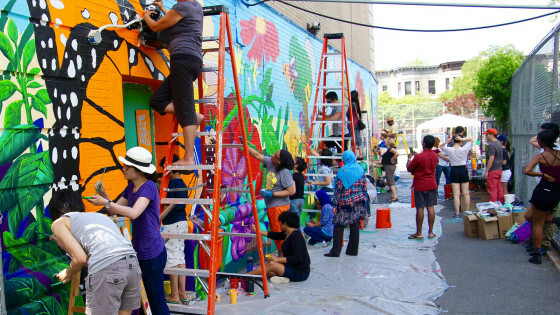 Since 2011, more than 10,000 students and 2,000 volunteers have completed 90 school and community mural projects totaling 45,000 sq. ft. In February, we moved our offices and studios to Central Harlem, where we help manage a 7,200 square foot space as the Harlem Hub Arts Academy on behalf of the Living Redemption Youth Opportunity Hub, and facilitate visual and performing arts programs directly and with contracted providers. 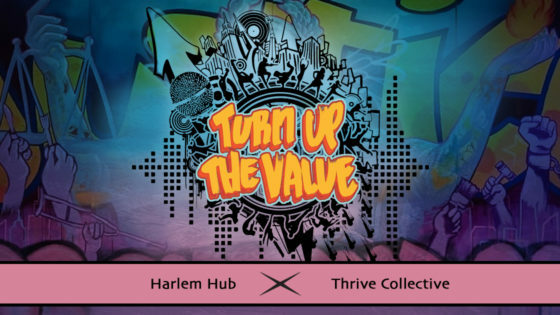 Thrive originated in Manhattan’s Lower East Side in 1996 as a youth center in NYC Public Housing serving primarily Hispanic youth. 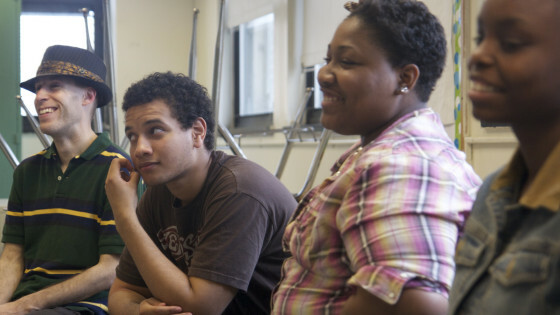 For fifteen years, 85-90% of our students came from the public K-8 school across the street. In 2006, we began strategically bringing our services into the school building, and completed our first mural project at the school in 2007. Within 3 years, PS/MS 34 was an A-rated school; by 2011 we incorporated Thrive Collective and transitioned to a school-based program model. 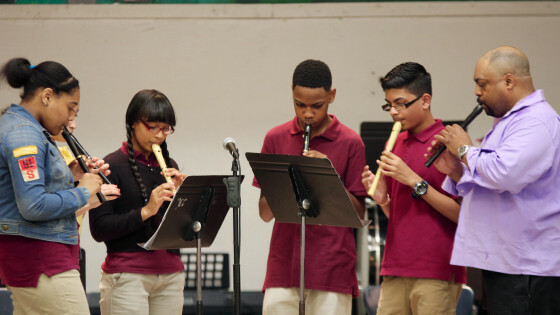 Our success in melding youth leadership development, mentoring, and arts and culture broadened our reach to include schools and neighborhoods citywide. 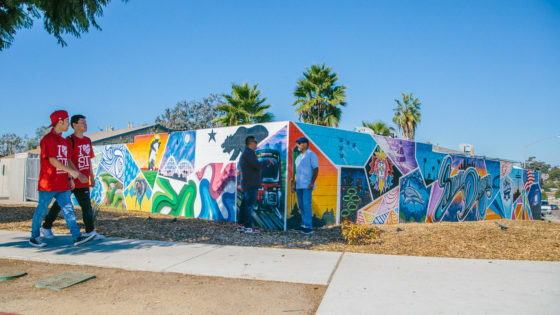 School Murals provides visual arts programming that creates a platform for students to cultivate a shared vision and develop the life skills to bring that vision to life in collaboration with others. 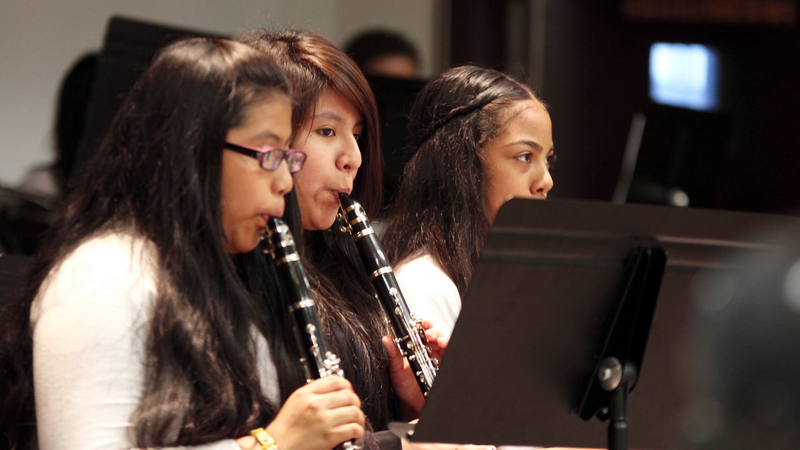 School Music provides music teacher residencies that blend performance-based theory and appreciation and culminates in age-appropriate recitals showcasing student achievement. 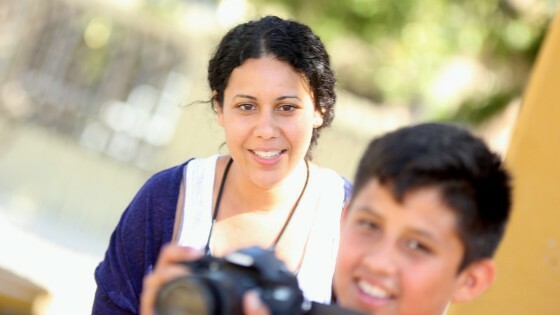 School Media empowers students to capture and tell great stories being lived in communities and schools every day by introducing the basics of film making, social media, and photography. 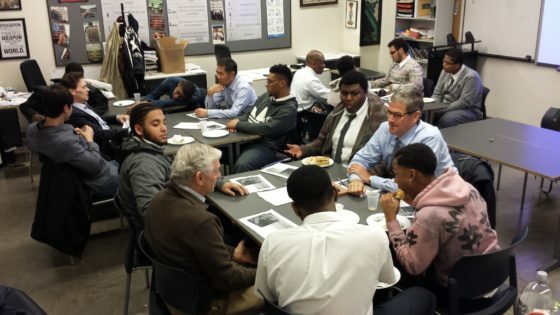 School Mentors provides purposeful adults for life and vocational mentoring that cultivates character and life skills, educational options, and professional relationships and networks. Project 25 is an annual, bicoastal student-led community service campaign. 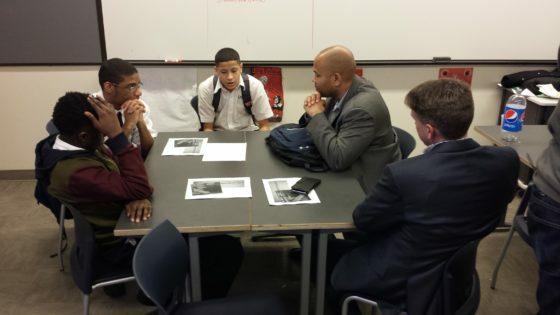 It began in San Diego in 2009 and came to NYC with SchoolPartners.NYC in 2015. Project 25 has helped fund thousands of students to creatively raise tens of thousands of dollars in service of others. Loving schools well through service catalyzes trust and demonstrates that you’re serious about partnership. 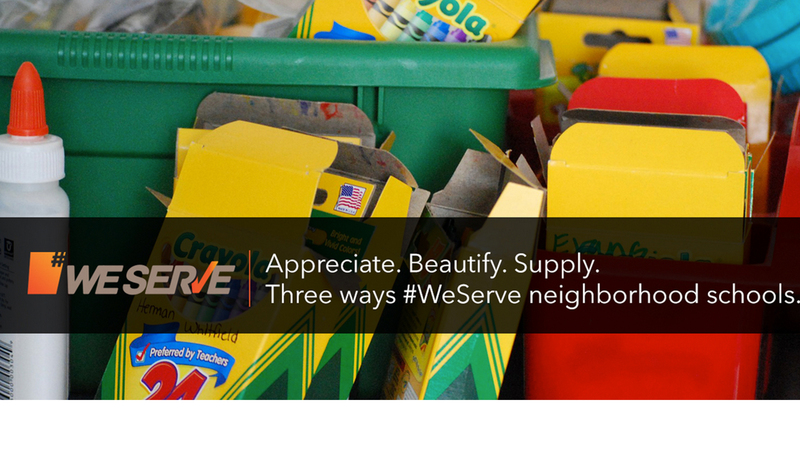 #WeServe organizes school-based service projects in three broad categories: Appreciation, Beautification, and Supplies. Hope Week provides theme-based motivational assemblies for public middle and high school campuses year-round. Our dynamic communicators include veteran NYC youth workers and musicians who inspire student action, achievement, and sustainable change. School Partners NYC celebrates and accelerates school partnerships that improve educational and life outcomes for students. We embrace partnerships as a vehicle for awareness, volunteerism, and wrap-around supports necessary for transformational change. 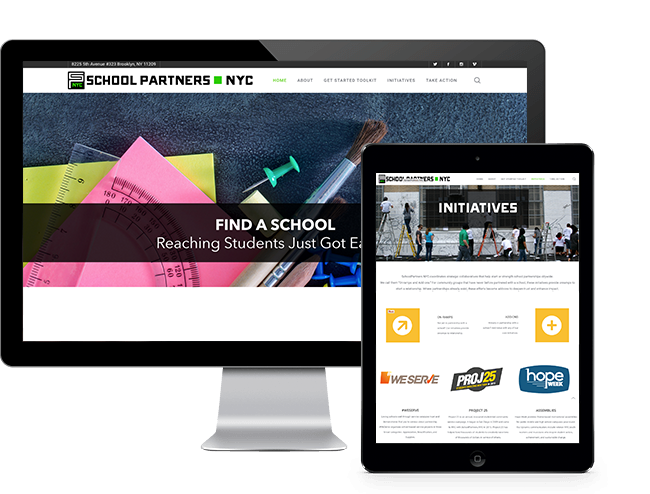 Our online platform includes a growing network of service providers committed to sharing best practices, ideas, and resources in support of New York City’s 1.1 million public school students and nearly 1,800 public schools. 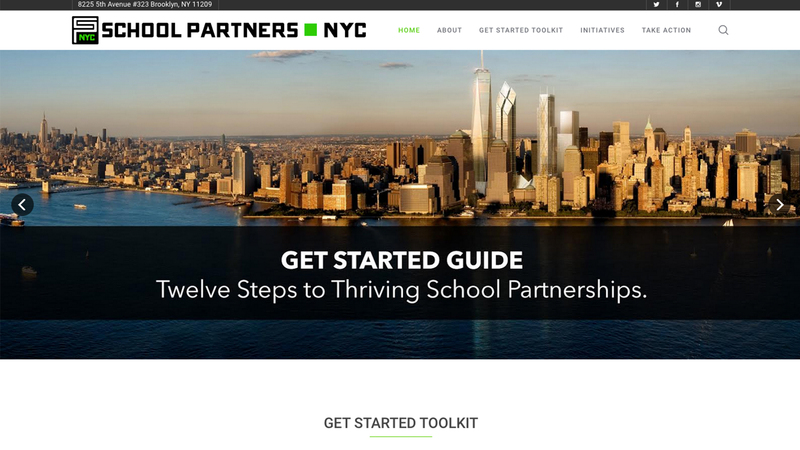 The SchoolPartners.NYC website offers a toolkit of resources and collaborative initiatives to start and strengthen partnerships citywide. Thrive Collective provides regular training and coaching opportunities for community groups and practitioners looking to partner with schools. We facilitate strategic planning retreats, program design consultations, conference keynotes and seminars, and professional development workshops for educators, activists, and community leaders alike. Our core leadership consists of practitioners, artists, and educators who, together, hold three doctorates and seven advanced degrees and have worked as adjunct and full-time professors at colleges and graduate schools in excess of thirty years combined. Thrive Collective partners with schools to make a real difference in student lives. The kind of difference that actually improves educational and life outcomes. Resourcing schools as authentic, trusted partners is a means to that fundamental, transformational end. Our goal, simply stated, is students and schools that thrive — without exception or condition. Why do we tolerate a world where schools without music teachers co-exist within walking distance of congregations that employ full-time music directors? Is there a way to mobilize congregational music directors to enhance music education at those schools? YES! 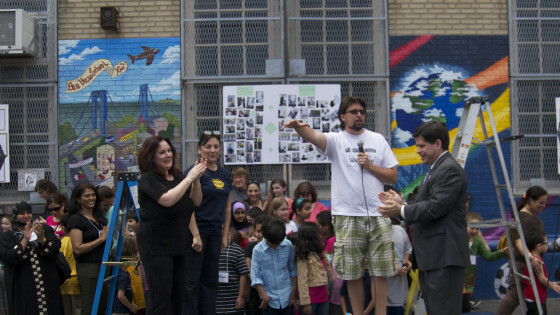 Students from PS 102 say, “Thank you!” to all our School Murals schools, partners, students, artists, volunteers, and sponsors for our January to August 2015 season. 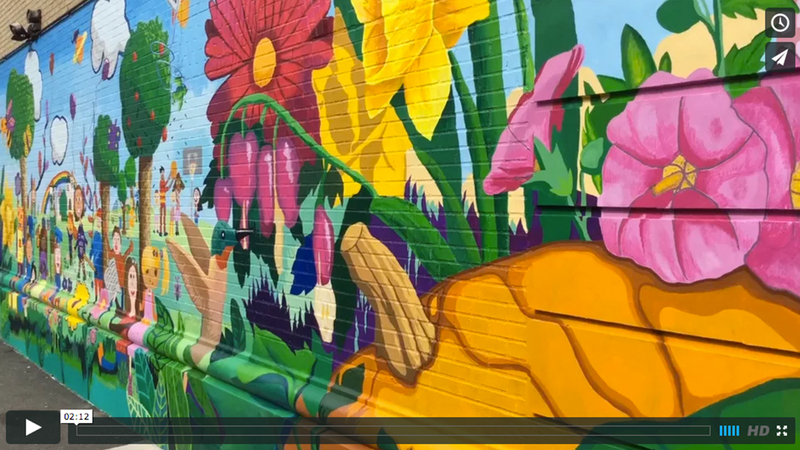 Together, we produced ten murals totaling 5,900 square feet of public art, involving 1,100 students from thirteen schools, and 500 volunteers from thirty-five partners. #WeServe Schools: Appreciate. Beautify. Supply. 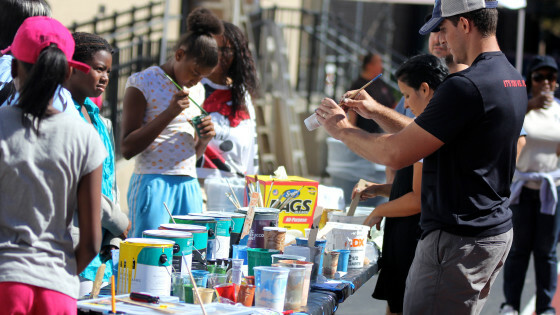 #WeServe organizes school-based service projects in three broad categories: Appreciation, Beautification, and Supplies. 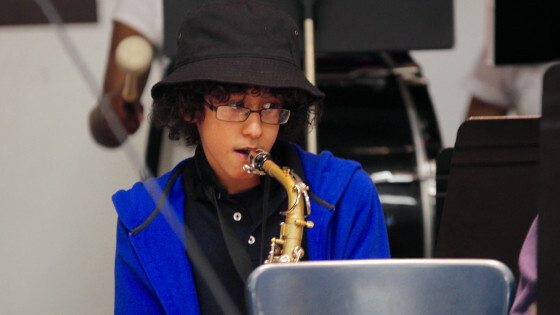 100% of your tax deductible, personal giving funds art, music, or mentoring in schools. You can choose, or trust us to choose for you. Join the movement to unite communities to restore the promise of public education in NYC schools.